Welcome to the blog for our new Etsy venture: www.SpaDelights.etsy.com. Our shop is still under construction and so is our blog. We look forward to opening and helping you pamper yourself! Look forward to our grand opening and blog updates soon. congrats! can't wait for the grand opening!! We favorite-d your shop already! Can't wait for the grande opening! 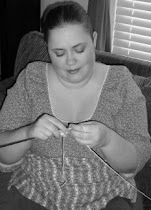 Dana Knits Away - Preparing for the Shop!